The Bisbee Turquoise mine, near Bisbee, Arizona, is one of the most famous Turquoise mines in America. Bisbee Turquoise has developed a reputation as a hard, finely webbed, strikingly brilliant blue stone of a high quality. High-quality Bisbee Turquoise is a hard, strikingly brilliant blue stone often with red-brown spiderwebbing, dendrites or hard chocolate brown colored matrix distinctive to the area near Bisbee. Bisbee Turquoise can be found in many different shades of color and quality, from a soft pale blue to brilliant deep and most every shade of blue in between. Green Turquoise is also found in Bisbee, but gem-quality green is rare. Bisbee Turquoise was originally discovered by the Phelps Dodge Company while mining for copper in the 1950's. It was found in an area of the Bisbee mine at what is known as the Lavendar Pit. They found the deposits of Bisbee Turquoise until the mid to late 1960's. During the time that the largest quantities of turquoise were being extracted from the mine, the company made no organized effort to recover it. It simply got loaded into large dump trucks and hauled off to the "dumps". Almost all recovered turquoise was picked up by company employees, taking it home in their lunch boxes, etc. Though this activity was prohibited, it was rarely enforced. For several years (mostly the early to late 70s), these individuals locally know as "dumpers", were the only source for this fine American Turquoise. In March of 1972 a miner named Bob Matthews was given the only lease ever granted for rights to mine Bisbee turquoise. He was said to have recovered more than 2,000 pounds of good to excellent turquoise by 1974. 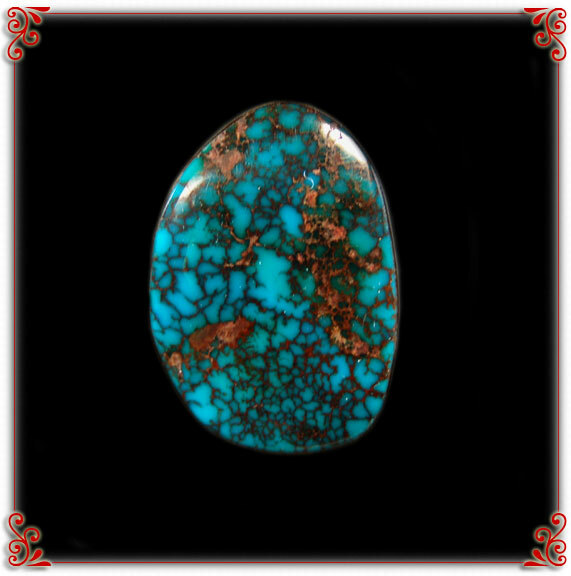 View a slide show of beautiful Bisbee Turquoise Cabochons. Most Bisbee jewelry being made with Bisbee Turquoise today is from long-time collectors of the stone, miners, old stashes and collections that are getting harder and harder to find every year. This is truely a rare Turquoise as there really was never that much of it to begin with and if there is any left in the mine it will take an act of God to get it out. Recently, the Phelps Dodge made the claim that there is no more turquoise in the dumps and covered them up with over 50 feet of dirt and dead rock.